I love makeup as much as the next beauty obsessed gal (or guy! ), but when it comes to eye makeup I gravitate more towards a one swipe shadow. I don't mind doing a more intricate eye look now and then with a lid color, crease, liner, etc, but most days I love to grab one shade and go. I picked up a few new additions to my collection that are perfect for the one swipe look. 1. Burberry Eye shadow in Pale Barley and Shell - Yes, I finally bought the much buzzed about, always out of stock, cult classic Burberry eye shadow shade in Pale Barley. People talk about this color being the perfect natural taupe shade that looks great as both a lid color and a crease color. 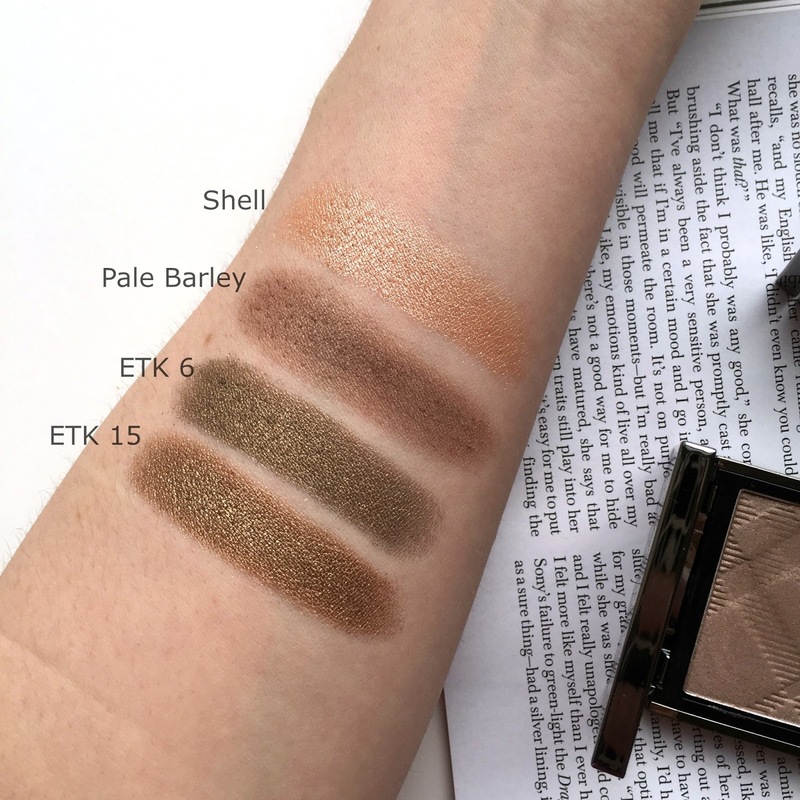 I have to agree that it is one of the most wearable shades because it has just the slightest amount of shimmer to give it dimension, while providing a medium pigmentation that can be sheered out or built up. It's definitely a must have in a neutral lover's collection. Shell is from their new wet & dry glow collection and has much more shimmer than the Pale Barley formula. However, the shimmer is gorgeous and gives the most spectacular gilded golden lid. I prefer to wear it dry though I still layer it over an eye shadow primer (I usually wear this or this). I have already moved both shades into my everyday makeup drawer as I suspect these will become staples of my daily look. 2. 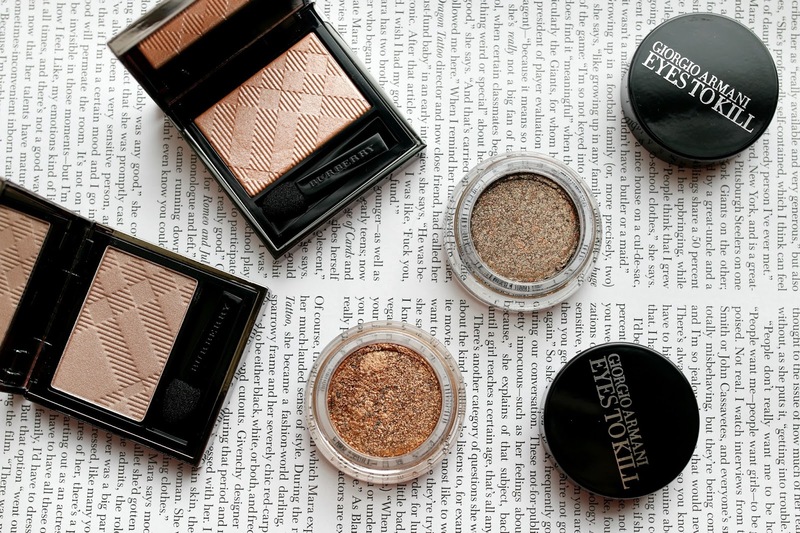 Armani Eyes to Kill Shadows in shade 6 and 15 - No these are not new, but as I have stated before - my blog is not always about the newest launches. There are so many products that I haven't tried that still deserve my attention so I love to discover these hidden gems. These cream/powder hybrid shadows have been on my must-buy list for ages, and I am so glad I finally snagged a few. The formula is not for the faint of heart as these are PIG-MENT-ED. Holy cow! Just trying to wash these swatches off was an ordeal itself. But they blend beautifully and the color pay-off is intense. The two shades I purchased were a bit darker than most of my daily neutrals, but can be sheered out so as not to be too dramatic for day. I suspected the shimmer aspect to border on glitter disco ball, but that was not the case at all and there is little to no fall out which allows me to still wear them during the daytime. In addition to a basic bronze (shade 15), I purchased an olive green shade (shade 6). It looks great with a variety of cheek and lip colors, and is a step (albeit small one) away from my standard brown shadows. I can't believe it took me so long to come to the Armani Eyes to Kill shadow party, but I'm here now and loving it. Expect to see a few more shades added to the collection in the future. Because I need more eye shadows like I need a hole in the head. Oh well. I have not yet tried any of the ColourPop shadows so I can't compare them to anything. However, I have heard nothing but great reviews!